Okay, this is a cute book. It’s not a great book, but it is enjoyable. I read this book on my Kindle. The drawings of the characters, especially the zombies, adds to the fun. Richard Brown wrote an interesting slant on the sinking of the Titanic—that while the ship sank, a plague broke out on the ship that the infected died and returned as zombies. 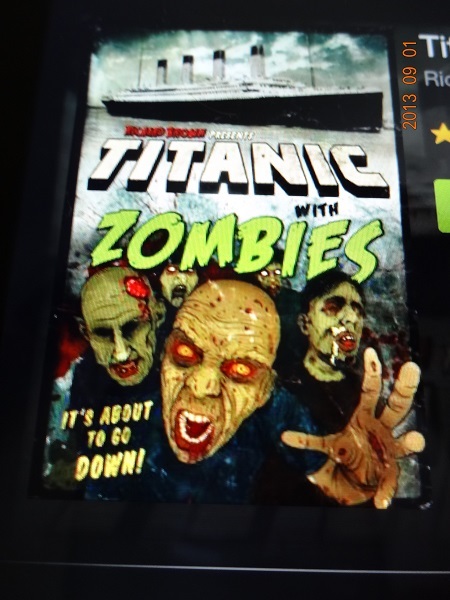 How do zombies end up on the ship? A poor, young Irish woman is infected by someone on the dock; he injects her with the virus before she boards the ship. She chases her attacker but he gets away. This is the most improbable part of the plot—who developed the virus, why and to what end—is never really explained. Also, the book ends with Charles Lightoller, the highest-ranking officer to survive the sinking, in London on the witness stand at the British Board of Trade inquiry. Big surprise that he has no plans to mention the zombies. Ice undies? Lightoller thinks of this while trying to escape a bunch of zombies as the ship sinks and he’s on a water-filling deck. One Amazon.com critic called this a “rolling of the eyes moment,” and I did. It cost me 99 cents. It was a quick read and fun. Another Amazon critic could not finish reading the book because of the gore. Who in their right mind buys a book with zombies on the cover and does not expect blood, biting, disembowelments, eating of flesh and all the rest?